350 x 240 mm. – 241 leaves, complete. With 100 large illuminated initials, 6 historiated initials, 5 of which on splendid title-pages. 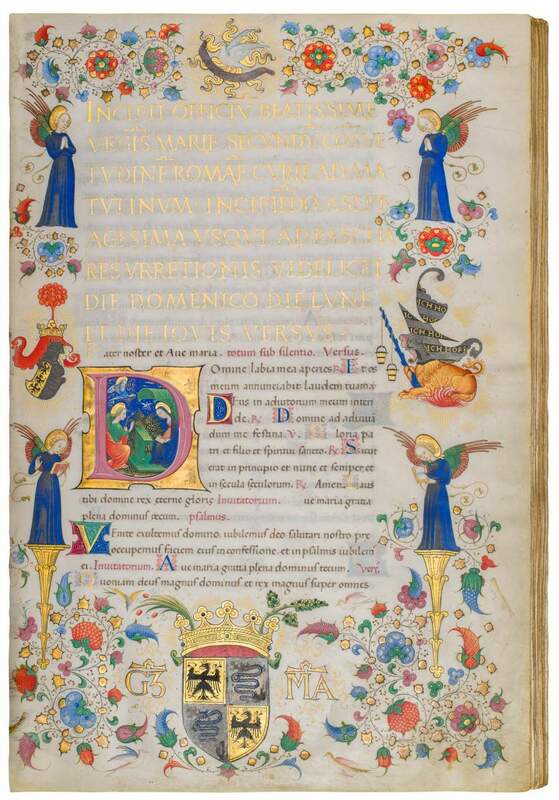 Written and illuminated for Galeazzo Maria Sforza, Count of Pavia and Duke of Milan. Emblems, ducal arms, monogram on 5 pages. Format, layout, script, and illumination of arms and emblems make this manuscript a truly princely, impressive codex. The illumination is attributed to the Master of Ippolita Sforza, named for a work for Galeazzo Maria's sister Ippolita on the occasion of her marriage to Alfonso of Aragon in 1465. His colourful, refined style shows great concern for decorative effect and charm. Influenced by, among others, the Master of the Vitae Imperatorum, the Ippolita Master continued in the present work the features that characterized his luxury manuscripts from the very beginning. Galeazzo Maria was a well-known bibliophile who had taken over the most prestigious Visconti library at Pavia. The more individualized texts originally at the beginning of this manuscript indicate that the book was intended for his own use. However, as the masses for Easter Week include instructions for the celebrant, it may have found use in the ducal chapel that was lavishly furnished at the same time (1473-1474). Likely, it was Galeazzo’s intention from the outset to prepare future prayers for the salvation of his soul. Murdered in 1477, his children came into the custody of his brother Ludovico 'Il Moro' Sforza.